2019 Summer Camp Dates are confirmed! Visit the Summer Camps Page for more info! 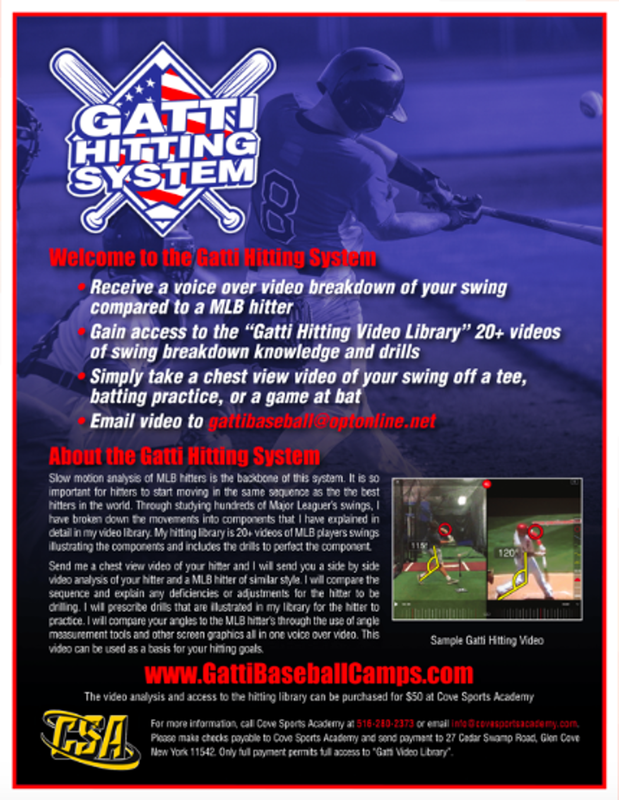 Welcome to the Gatti Hitting System. First is the Gatti Video Library. In this 20 + online tutorial video library I break down the entire swing. You will see the best MLB hitters in game swing slow motion breakdowns. I analyze each move they make from the first to the very last. I chop up the swing into understandable components for the viewer. You will learn what every body part does, when it does it, and why it does it. After the component breakdown you will see drills for you to do that target the component. This $20 library will be your best resource for your swing training. See sample video below. This library is perfect for parent, player or coach. Next you have the option of emailing me a simple video of your player's swing (chest view) from your phone camera. I will reply back with a voice over critique analysis of your swing compared to a MLB hitter. I will also assign the drills that you will do from the video library you have already purchased. This analysis is a one time charge of $50. There is no monthly membership. However, it is recommended to send me subsequent videos to build your swing systematically. See sample video below. Pay as you go... Getting better every day!! Click here to buy the library. Click here to the view a sample of my Video Library. Access complete 20+ library of swing breakdown and drills for a one time fee of $20. Click Video to the right for a sample of a video analysis. Click tab on top to learn about Team Video and One-on-One Seminars for your individual players, team or organization. We are thrilled to announce our camp dates this summer!! For the fourth year in a row, a MIDDLE SCHOOL CAMP instructed by North Shore Varsity Coaches Scott Lineman and Rob Gates as well as one week of Softball training hosted by NYiT Head Coach Steve Christianson. Rejoining the Gatti Camp team is Steve McQuail, Nick Yip and Ray Chaputian. LI RED DOGS - Looking for 13/14u Players! CLICK ON THE RED DOGS PICTURE BELOW FOR MORE INFORMATION ON HOW TO REGISTER TO TRY OUT! LI Red Dogs Baseball- Looking for 13u/14u Players! Blue collar athletics is a non-profit, 501-c tax deductable travel baseball organization started by coach Dom Gatti and other community baseball enthusiasts. We currently host travel baseball teams ages 8u -12u. Our mission is to provide a high level baseball experience at a low cost to families. We are a family oriented organization that hosts multiple family run fundraisers to offset the costs of the season. Next Level Baseball (NLB) is an elite travel organization that focuses on creating a limited number of high quality teams rather than numerous average teams. NLB may have no team at a specific age group rather than field a team that is not up to the quality of play that is demanded by the NLB organization. ©2019 Gatti Baseball Camps / SportsEngine. All Rights Reserved.